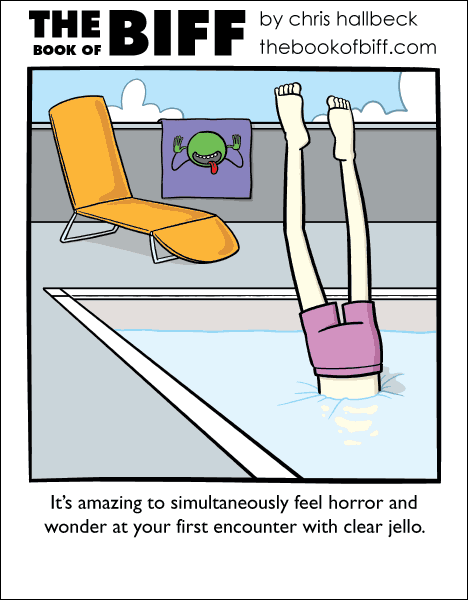 I’m always fascinated by large volumes of jello. I once visited an apartment in Boston that was setup as a multiroom art installation. Lots of paintings and drawings and such but I kept going back into the bedroom to look at the dresser. One of the drawers was pulled open and filled solid with red jello. So very tempting to stick my hand in it. I think the towel made him jump into it.. I agree with Biff though, that’s a creepy (yet awesome) towel. Nice Hitchhiker’s Guide Towel Biff! And yes, nice H2G2 towel. Nice to see I’m still not the only one who celebrates it. I’m sure Biff always knows where it is, too. The first thing I came to think of was that Mythbusters episode when they swam in syrup. Not the same thing as jello, but still… It’s very interesting to see people swim in syrup, so I wonder what it would have looked like if they had tried to swim in jello as well! Shoot, I forgot that was today until I read this comic and I’m already at work. I forgot about Towel Day, too. I am in the process of knitting one, but I don’t think my 2 inches of towel-like material counts yet. This is why Biff can do what he does. He knows where his towel is. I have one here at work. If anyone deserves the accolade of being one hoopy frood, it’s Biff. Not exactly what I expected to find in my dessert…. Shoot! If had remembered it was Towel Day today, I could have had a towel draped fashionably around my shoulders when I got my driver’s license renewed! Anyway, Biff should be relieved that he didn’t belly flop into that Jello instead of diving–that would have stung terribly! Then again, it looks like he just might suffocate in his current position. *to the comment* Why would a dresser be filled solid with jello? I want that gosh-dang towel so badly. Hey Chris, I couldn’t find any contact info so I guess I’ll just do it here. Like many I use adblock.. like less I also have a couple of other barricades in place. Barricades I erected myself. I’ve been quite a fan of your comic yet thanks to this barricades I never contributed even a penny to help. As they also blocked Project Wonderful. Today finally I got off my lazy bum and opened the path for it in the more difficult to configure ones. So this is my apology for being a bum all these times, man. I’m surprised that so many of the readers are familiar with The Guide.